While attending the International Boat Builders Exhibition (IBEX) in Miami (and the Annapolis and Ft. Lauderdale Boat Shows) this past fall I came across a variety of new and interesting products. The exhibitors floor and tents are a veritable gearheads candy store: row upon row of interesting gear in booths that are more often than not staffed by knowledgeable personnel who enthusiastically talk about the products they represent and in many cases invent and build themselves. Fuel polishing systems have become exceptionally popular in the last few years and as such there was no shortage of floor space dedicated to this worthy concept. I delivered a lecture on the subject at IBEX and the questions from the audience, mostly builders and boatyard folks, were excellent and plentiful indeed. This demonstrated to me, however, that even the professionals are not clear on the preferred installation approaches or the differences in the available systemsmake no mistake about it, the differences are vast. With the increase in sheer volume of fuel polishing systems its inevitable that there will be differences. The good news is, from what I could see nearly all of them are or would be effective to some extent at removing contamination. Beyond that, however, things get somewhat hazy. My own personal criteria for fuel polishing systems are, among other things, that they maintain not only the cleanliness of the fuel but the tank as well. In order to do so, they must utilize a pump whose volume is significant, on the order of at least 100 gallons per hour. This pump capacity ensures meaningful movement of fuel through the tank, which is a critically important aspect of a fuel polishing system, particularly for vessels that spend much of their time at rest. Thus, capacity or volume matters when comparing fuel polishing systems. Remember, this is just my definition, any person or manufacturer can plumb and wire a small electric fuel pump to an equally small filter and call it a polishing system, theres no official definition. And, they can install it by paralleling the pickup and return plumbing to the tanks and engines existing ports. In those cases the fuel will be filtered when the engine is not running, which could be construed as polishing. Indeed, as mentioned in the title of this column, all fuel filtration is good. If you choose a low-volume polishing system, what I like to call, and not in a disparaging way, supplemental filtration, you are certainly on the right track. All filtration is good. However, dont expect it to perform in the same manner as a high-volume system. Roughly speaking, supplemental filtration systems are most effective at cleaning the fuel rather than maintaining the cleanliness of the tank. This is strictly a function of their low-volume pumping action. 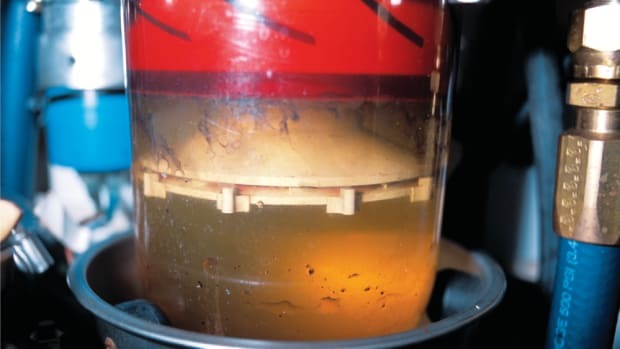 If the vessel is under way frequently and the fuel within the tank remains agitated, which prevents a phenomenon known as agglomeration (small suspended particles attract each other, forming larger agglomerates, which then sink to the tank bottom) and settling of heavier contaminants such as water and asphaltine, then supplemental filtration will often do a creditable job of keeping the fuel clean. If, however, the vessel remains at rest for long stretches of time, then supplemental filtration is likely to be less effective than a high-volume polishing system. 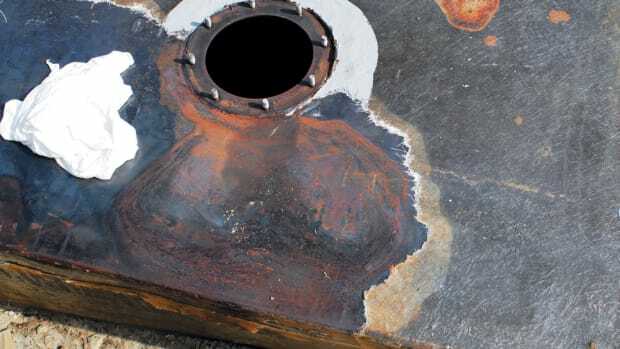 Additionally, a high-volume polishing system should be sized and installed so it passes all of the fuel in the tanks through its filter three times in a reasonable amount of time. Reasonable is open to interpretation, however, my definition is no more than 8 hours. Thus, a supplemental filtration system may find itself challenged when mated to a large tank or tanks. In addition to the selection of the polishing or supplemental filtration systems themselves, the other hurdle frequently faced by those purchasing these systems is obtaining proper installation. Even the best, high-volume polishing system will be of little value if its not properly plumbed to the vessels fuel tanks. This is especially important for high-volume polishing systems. In order for them to work most effectively they must be plumbed using dedicated fittings that share no part of the tanks or engines/generators existing fuel system. This is necessary for two reasons. 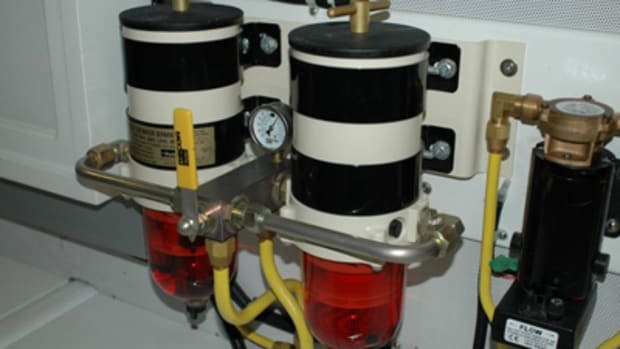 One, existing fuel plumbing is nearly always too small for high-volume polishing pumps, polishing systems often require plumbing as large as three-quarters inch inside diameter. Two, the location in the tank of existing pickup and return fittings is nearly always detrimental to the efficiency of a polishing system. Polishing system pickup and return fittings should be located as far apart as possible, preferably at opposite ends of the tank, ensuring maximum movement of fuel. And, the polishing system pickup should be close to the bottom of the tank, closer than the primary engine pickup, ensuring that it removes all or as much water and debris as possible. Finally, where installation plumbing is concerned, the return fitting must be equipped with a drop tube. This ensures maximum turbulence at the bottom of the tank where debris invariably accumulates and it avoids aeration of the fuel, which hastens its degradation and increases the risk of erratic engine operation. Where supplemental filtration is concerned, large diameter plumbing is not an issue, however, paralleling filtration with engine fuel supply can lead to problems and, the fuel can short cycle between the pickup and the return within the tank, minimizing how much fuel is actually filtered. The elephant in the room that I havent addressed is expense. 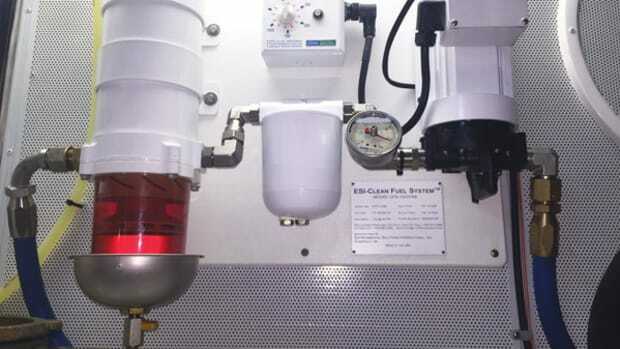 High-volume polishing systems that are properly plumbed to fuel tanks in the manner described are nearly always expensive affairs, typically in excess of $10,000 installed, while supplemental filtration systems are often 1/10 of that. If this simply isnt in your budget, or if you have a smaller tank or if your vessel is used frequently (keeping the fuel agitated and contamination in suspension), you may opt for the considerably less expensive but possibly less effective supplemental filtration route. Remember, when it comes to diesel fuel, all filtration is good.